You will receive your volunteer assignment via email with a link to an online training video. First-time volunteers who have never been to the festival site or those who have difficulty viewing the online video are encouraged to attend our 10 a.m. to 11 a.m. on-site training the Saturday before the festival. 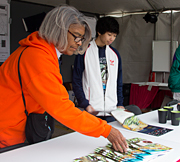 Volunteers must be sixteen years of age or older to be able to volunteer with the Louisiana Book Festival. What do I wear/bring the day of the festival? 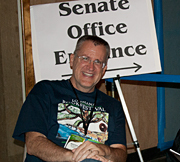 You will wear a specially designed volunteer T-shirt you may pick up upon arrival to the festival. T-shirts are not guaranteed to volunteers who sign up after Oct. 6. Wear comfortable slacks/jeans, long shorts or a skirt in a solid color and comfortable shoes – be prepared to stand a lot! You may also want to bring a sun visor, hat, sunscreen or rain gear depending on the weather. Unfortunately, the space in the volunteer tent is not secure. The festival cannot store personal items. There are a number of parking garages and parking lots available to festival attendees. Most are within walking distance to the festival area. You will receive a map of specific locations during training. Where do I check in on the day I volunteer? Check in at the volunteer tent at the time assigned, not before. You do not need to arrive early, as shifts have been designed to allow for check in. 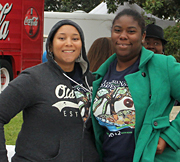 Upon check in, you will receive your assignment, directions to volunteer locations, a name tag and a Louisiana Book Festival T-shirt. Where do I go when I complete my assignment? Return to the volunteer check in site when you have finished your assignment to turn in your volunteer evaluation. If you are unable to fulfill your commitment, please make an effort to find a replacement and share that information with the replacement and contact the volunteer coordinator with the replacement's name and contact information. Contact us if a replacement is unable to be secured.